This plate was produced in Limoges, a city that specialised in the high-quality production of enamelled objects from the middle of the 12th century onwards. The inscription “COVRTOIS-FE[CIT]” on the back of the plate allows us to identify as its creator Martial Courtois, a Protestant descended from a family of enamellers. The front of the plate shows the Whore of Babylon mentioned in the Book of Revelation: “[…] and I saw a woman sitting on a scarlet beast, full of blasphemous names, having seven heads and ten horns. […] She had a gold cup full of abominations and of the unclean things of her immorality in her hands.” (Revelation 17:3-4). The composition of this scene goes back to a woodcut by Lucas Cranach the Elder illustrating Luther’s “September-Testament”, printed in Wittenberg in 1534. The woman is wearing a tiara and, therefore, is equated with the Pope; the city in the background evokes Rome. This virulent charge against the Catholic Church is intensified by the kneeling posture of representatives of the spiritual and temporal powers positioned in front of the seven-headed beast. 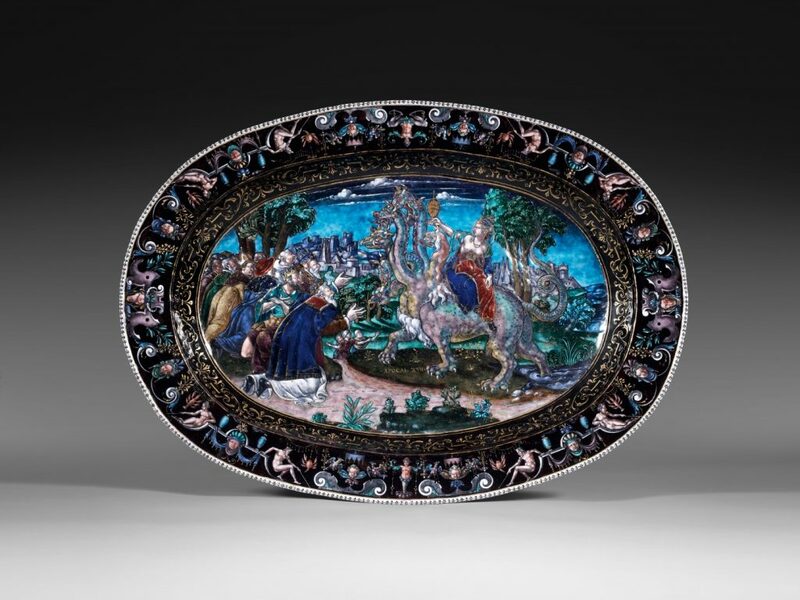 The frieze of rinceaux running along the edge of the plate and the design on the back testify to an ulterior contribution to Cranach’s theme by French Renaissance artists who added motifs such as grotesques. Martial Courtois then adapted it to a painter-enameller’s pallet of bright and glimmering colours. 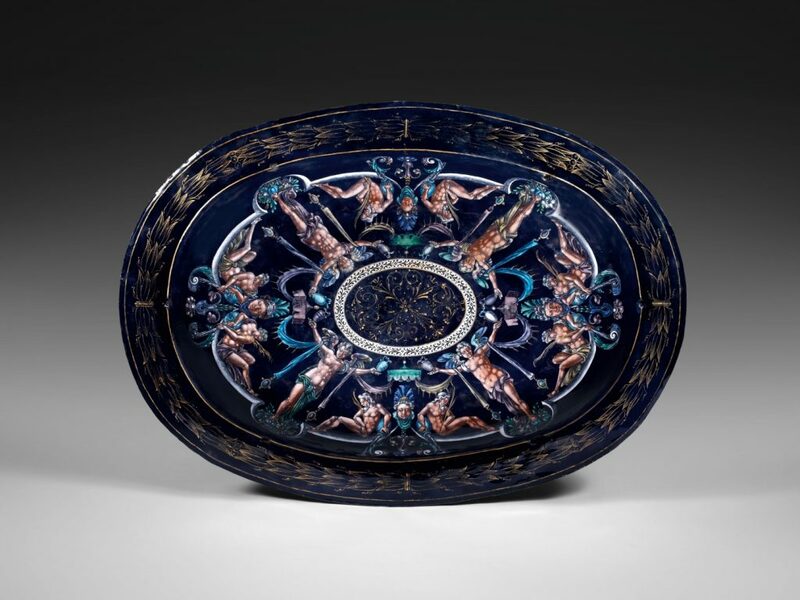 There are three other versions of the plate: one is kept in the Staatliche Kunstsammlungen Dresden, the second one belongs to the British Museum, London, the third one to the National Gallery of Art in Washington.